The trees on the temple grounds are showing a variety of beautiful fall colors now! Be sure to visit within the next two weeks to get some great photos of the foliage! Not many people are able to see the garden from this angle! 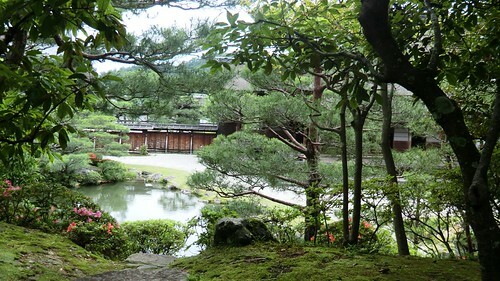 Viewing the garden from Shinden gives you the best angle to see all of the garden, but there’s something interesting about looking through the trees toward the garden, too. 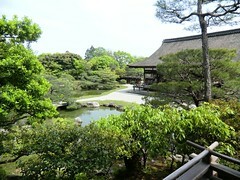 The North Garden stands opposite of the more austere South Garden in the palace area of the temple. 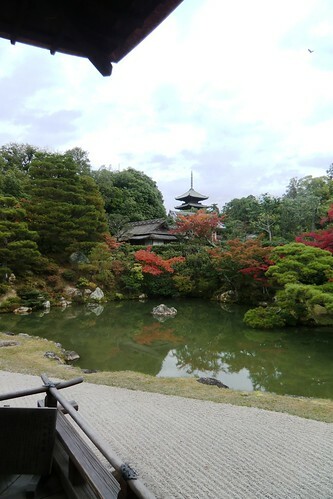 The North Garden was originally completed in the 17th century, but was destroyed in a large fire with the rest of Goten during the Meiji Period. 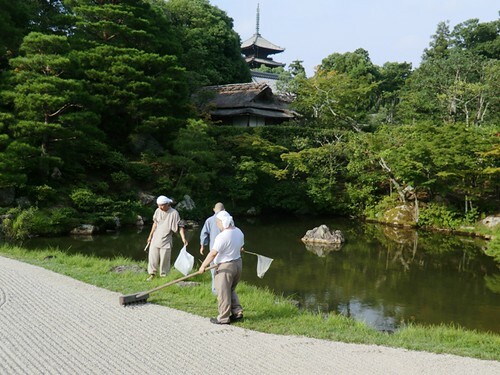 The garden was reconstructed during the restoration of Goten in the early 1900s. The garden is in the “pond-viewing” style and features a large pond in the shape of the Chinese character “心” meaning “heart” or “spirit.” There is a small waterfall to the left of the garden, and on the right there is a manmade hill on which a tea house sits. This tea house is named “Hitō-tei” and is over 200 years old. 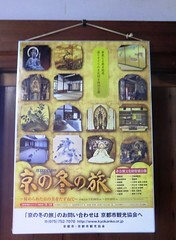 The building was damaged during the Great Hanshin Earthquake in 1995, and while there were some repairs after the earthquake, the tea house has never needed to be rebuilt. 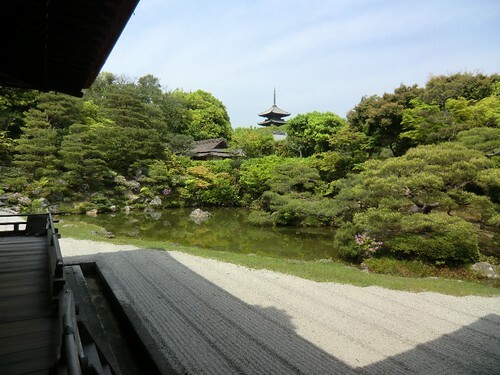 Hitō-tei was a favorite tea house of Emperor Meiji’s grandfather, and because it was patroned by the emperor Hitō-tei forgoes the usual “crawling” entrance found in tea houses in favor of a “nobleman’s” entrance tall enough to walk through without bowing. The roof of the Middle Gate is visible beyond the trees surrounding Hitō-tei and the five storied pagoda stands in the background. 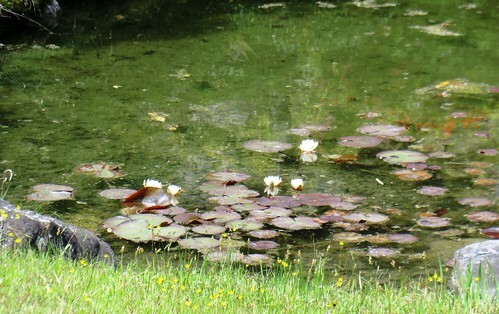 There are some water lilies blooming in the pond in the North Garden! The reflection of the trees in the water makes the pond look like it is out of an impressionist painting, don’t you think?